Unknown caterpillar, originally uploaded by trekr. I have no idea what kind of caterpillar this is. It seemed odd to find it on the smooth bark of a crepe myrtle tree. 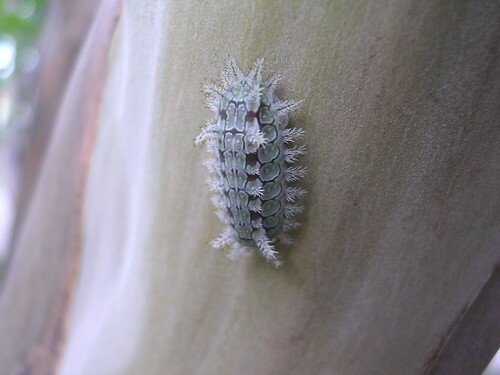 It resembles a saddleback caterpillar, but if anyone knows what it is please leave a comment. This entry was posted on Sunday, June 24th, 2007 at 6:33 pm	and is filed under Garden. You can follow any responses to this entry through the RSS 2.0 feed. You can leave a response, or trackback from your own site.